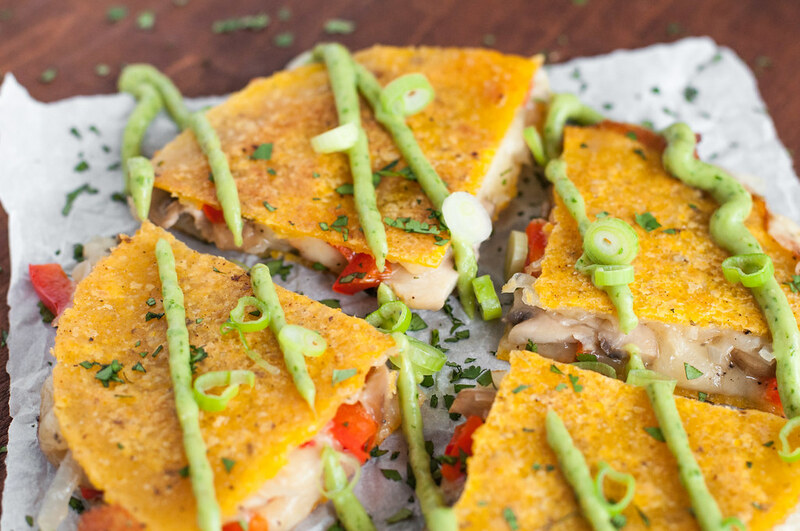 If you skip down to the recipe and read the ingredients in these quesadillas, see if you can discern what, exactly, they have in common with steakhouse fare. Because I’m stumped. I first made these quesadillas months and months ago, back in March or April. I think I was going for a themed quesadilla, something that you might expect to see steak in but then just exclude it to make it meatless. The closest thing I can come up with is that it resembles a steak sandwich quesadilla. Kind of different from a steak dinner. There are no potatoes, creamed spinach, or whatever else you eat next to a steak. I seriously can’t even remember the last time I stepped foot in Capital Grille, even though it was a bi-weekly affair when I first moved to Connecticut. However, you might see a peppers & onions combo, some mushrooms, and that spicy pepper jack cheese piled atop a London Broil at the Minnesota State Fair, or your own favorite steak sandwich. You know what, though? Meatless steakhouse quesadilla has an ironic ring, so I’m keeping it, as illogical as it may be. I hope you’re as excited as I am about our second quesadilla Friday in a row. I don’t plan to make this a regular thing (I can see it now: Black Friday quesadillas with leftover turkey and ‘taters. ), but it’s a fun coincidence. Life is always better with themes, right? Um, no, only if you’re in college and wondering what to wear to Saturday’s party. This week’s ‘dilla is totally different than last week’s sweet eggplant and gouda variation. They are both gluten free, and, okay, maybe they do both have some cooked sweet onions, but other than that–totally different. 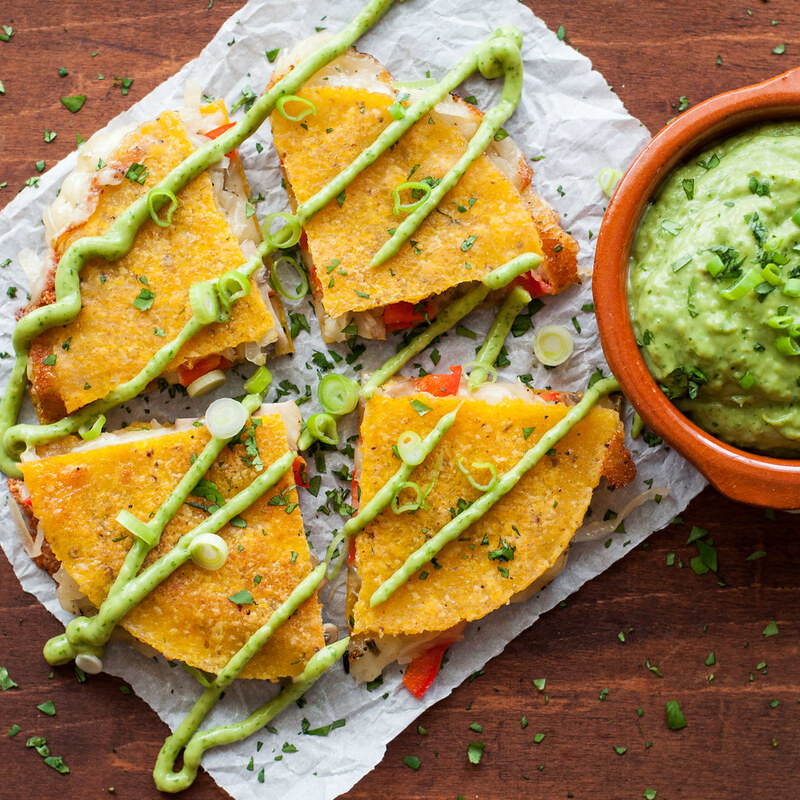 The steakhouse quesadilla is decidedly less sophisticated and slightly more true to its Mexican roots than its eggplant predecessor, featuring corn tortillas and an avocado sauce with all sorts of flavors, including cilantro and lime, coming at you. It includes pepper jack for a nice kick, and the onions are caramelized stovetop, a slightly painstaking process. I’m going to go to a weird place right now, but maybe caramelizing onions is like childbirth? I seem to forget the pain and keep coming back to it because of the glorious end result. Hopefully I’ll say the same about my own offspring someday. Weird. I told you. I have not had a single sip of wine as I write this, either. Another difference between my first two quesadilla recipes on this blog–the first coddled me through my fear of “the flip” by using a large, folded in half tortilla which could be rolled over in the pan without much risk of a trainwreck. I knew I had to conquer my fear this week, and that I did. I only got minor hot oil splatters all over my arms in the process, but I learned (quickly) from my mistake, and that’s the rationale behind what might sound like a tedious cooking process described in the recipe. Do not skip wiping the oil out of the pan. You need it to give the tortillas a little initial fry. You do not need it at all splashing up at you as a quesadilla lands in the pan after being flipped. That harsh lesson got me over the hump, and I’ve successfully flipped four consecutive quesadillas since that first try, all splatter free, so I know you can do it effortlessly. I wish I had an action shot of just one of those flips, but trying to add a camera to the equation most definitely would have ended in disaster. The recipe looks long, but you’ll probably make it in less time than it takes to read. Sometimes as I’m writing my recipes, I consider shortening them, but part of my goal is to be instructive. Personally, I would struggle if a recipe nonchalantly told me, “Step 3: flip the quesadilla.” It’s almost like the recipe-writing powers that be (or Pinterest) are trying to trick you into making it, even though they know it’s not that easy. I want to share details for the things that might cause problems, uncertainty, or frustration. Worst case scenario, you’re already a quesadilla flipping pro, and you can just skip through that section. I’ve read some articles that criticize today’s recipes, of the opinion that home cooks these days have no foundational knowledge or common sense (or the internet?) and must be spoon fed detailed directions. I agree that kitchen basics aren’t necessarily innate for my peers and I, but writing skimpy recipes isn’t going to teach new skills, so I try to build mini lessons into my posts and recipes, to save you having to go research how to caramelize onions or…flip a quesadilla. As you read this, I may just be in the kitchen putting the finishing touches on a recipe for rustic quinoa and sausage stuffed acorn squash. It’s also an oldie that I’ve never gotten around to repeating–I made it for the first time back in February when we visited our friends Chris and Erica (as in, Erica who shot our gorgeous engagement photos) to see their new baby. It seems like ages ago, and I’m pretty excited to get one of those things back in my belly–squash, not a baby. Word on the street (okay, in our living room) is that it might snow today. I have my fingers crossed that the squash will make a nice healthy, cozy dinner for the first snow of the year! To caramelize the onions, heat 1 tablespoon each olive oil and butter over medium high in a large skillet until butter melts. Add sliced onions, sprinkle with about ¼ teaspoon salt, and stir constantly for 15 minutes. Reduce heat to medium low and stir every 5 to 10 minutes until onions caramelize, anywhere from 60 to 90 minutes, depending on the heat used. Onions may not darken, but they’re not when they have a jam-like consistency and taste quite sweet. Store in the refrigerator or freezer if not using immediately. Wipe out skillet from onions and heat 1 tablespoon olive oil over medium. When shimmering, add sliced mushrooms. Stir infrequently as they cook, eventually releasing their liquid, which will evaporate, about 10 minutes total. Sprinkle lightly with salt and set aside. For each quesadilla, heat 1 ½ teaspoons vegetable oil over medium high in a nonstick skillet large enough to hold 1 tortilla. Lay a tortilla in the oil, and cook as it sizzles, on 1 side only about 45 seconds. Remove and place oiled side on 2 layers of paper towels. Repeat with a second tortilla. Carefully wipe out the skillet with a paper towel, leaving just a trace of oil. 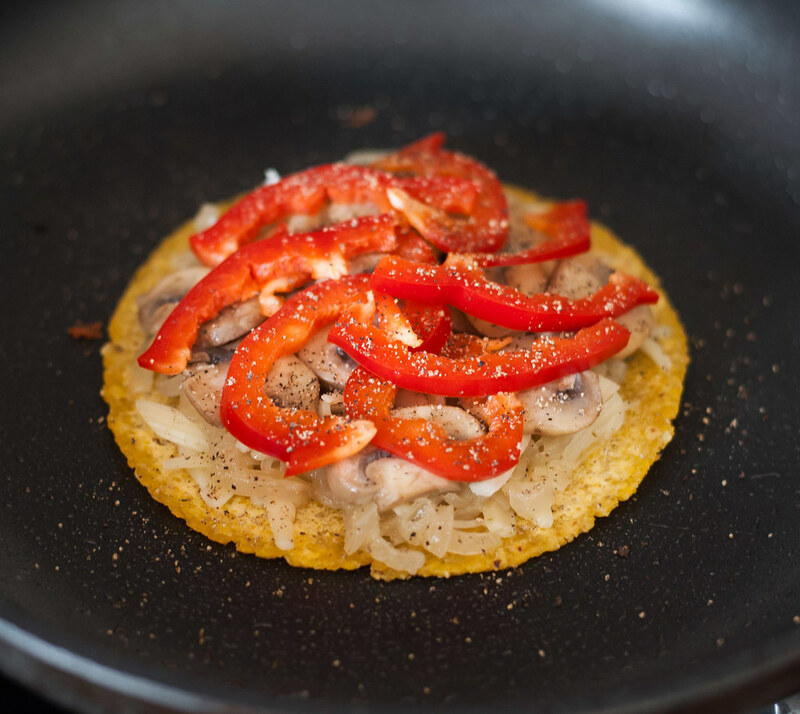 With the quesadilla ingredients accessible, place one tortilla, oil side down, in the skillet, and turn heat to medium. Layer a small handful of cheese (1/3 to ½ cup), followed by a fourth of the caramelized onions, mushrooms, and red pepper. Sprinkle with black pepper, top with more cheese, and lay second tortilla on top, oiled side up. Weight down the quesadilla with a small, heavy pan, or using the back of your spatula, and cook about 2 minutes (it will be sizzling gently). To flip, pick up quesadilla on a large spatula, and use all your courage to give it a brave toss so it lands on the other side. Cook another 2 minutes, until the second side is crisped, then remove and repeat the process to make the remaining quesadillas. 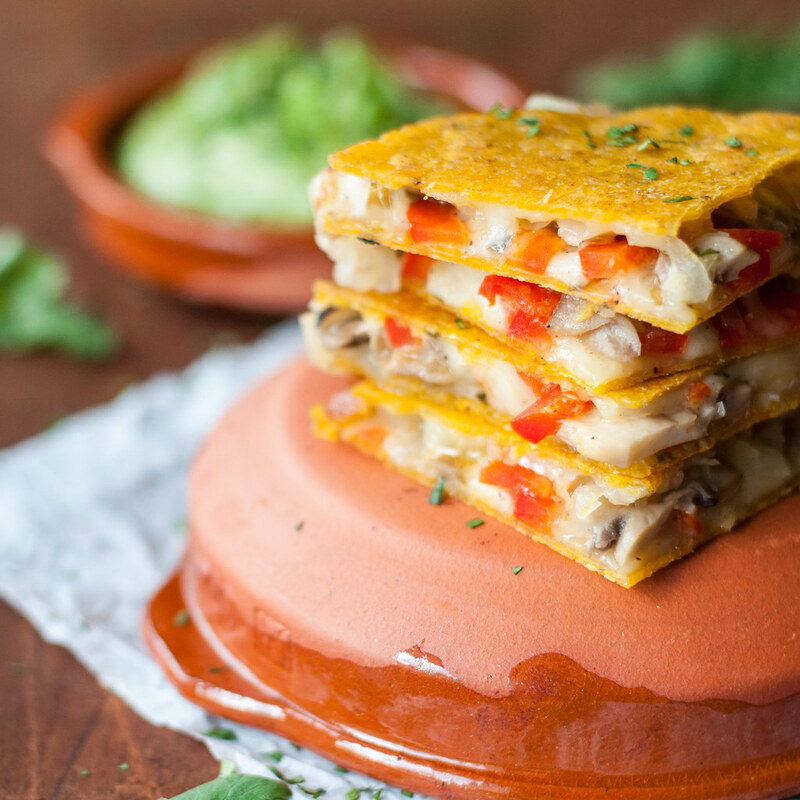 Hold finished quesadillas in a warm oven until serving. Cool slightly before cutting each into quarters. 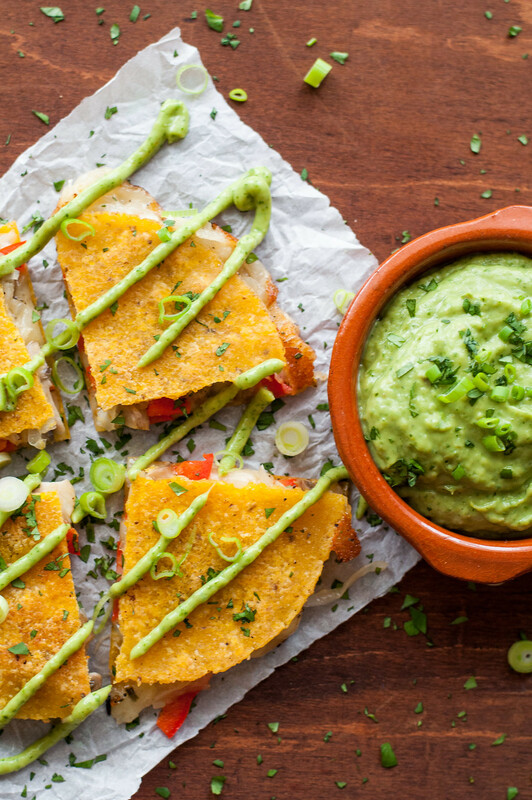 The quesadillas are great with white cheddar, instead of pepper jack. Caramelize the onions in advance for much quicker quesadillas. I usually start with 2 to 3 lbs. of onions and make a big batch while doing other kitchen tasks, since they just need an occasional stir. The caramelized onions are delicious on everything and freeze well. I use the Joy of Cooking method for caramelizing onions, because I find the initial high heat is helpful for jump starting the process. Discard the avocado stones and scoop flesh into a food processor. Add remaining ingredients, except water, and process until very smooth. Pulse in water until sauce reaches desired thickness. Ideally, it’s a dipping sauce that isn’t thin enough to pour, so if you prefer a dressing-like consistency, add more water. If the flavor becomes too diluted, add another couple jalapenos and a splash of Worcestershire. I don’t recommend adding more than ¼ cup of water. Leave out worcestershire sauce to make it vegan. To achieve a pretty stream of avocado sauce without diluting the flavor, use a squeeze bottle to serve it (that’s what I did for the quesadilla photos). It’s also fun to squirt a big, soft-serve looking blob of it in the middle of each plate, where the corners of the quesadilla quarters meet. 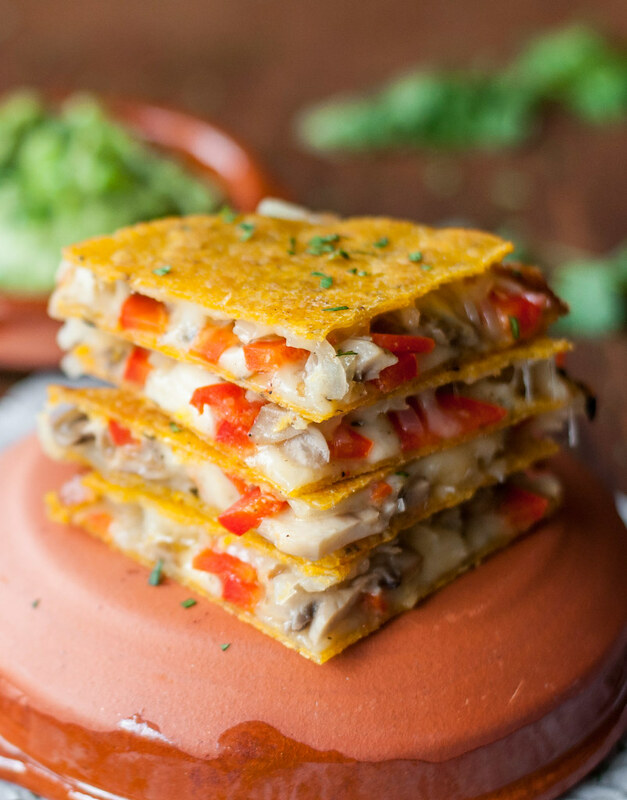 I love mixing up Mexican and taking a traditional Mexican dish like quesadillas or tacos and making them new and exciting with something different. Thanks for sharing yours and the inspiration! Thank you for that Yummy quesadilla recipe! My daughter just had her third birthday and we have tried several different types of quesadilla and had fail miserably…but this was a winner! We did alternate the recipe a little by chopping the veggies in smaller bite size pieces because she is a picky eater but besides that she ate it all up without us asking her.